Dé Sathairn seo caite, ghlac daltaí ó Cholaiste Pobail Osraí páirt i dtaispeántas ealaíne ar son a gcontae suas i nDún Uí Choileáin Bhaile Átha Cliath. Cheap, dhear is thaispeáin na daltaí dhá phainéal gloine dhaite ar an lá. Nuair a thagann siad ar ais, beidh na painéil suntasacha ar taispeáint ó seo amach ag doras na scoile. 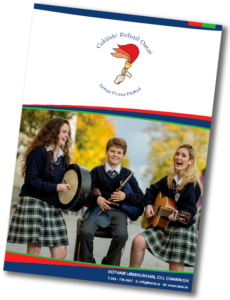 Ba chomhoibriú é an tionscadal idir roinn ealaíne na scoile agus Gloine Uí Sheireadáin. Ba í aidhm an tionscadal ná go mbeadh tuiscint agus ómós níos fearr ag na daltaí ar an gceird sheanda seo. Tar éis dóibh na scileanna a fhoghlaim is a thriail, tá leirthuiscint acu anois ar an bpróiseas agus ar an méad ama a chaithfeá cur isteach. Maith siad as ucht a cuid gaiscíochta is as ucht na hoibre tábhachtaí. Transition year students at Coláiste Pobail Osraí, Kilkenny represented their county at the Creative Engagement Exhibition in Collins Barracks, last Saturday. The students designed, made and exhibited two stained glass panels at the exhibition.The magnificent panels, when they arrive back from the National Museum, will be on show permanently at the school entrance. The main of the project was for the students to develop an appreciation of an old craft, stained glass.By learning and trying the skills themselves they now have a clearer idea of the processes involved, the time it takes, the patience needed and sheer scale of such a creative project.The students are to be commended on their achievement and their journey.